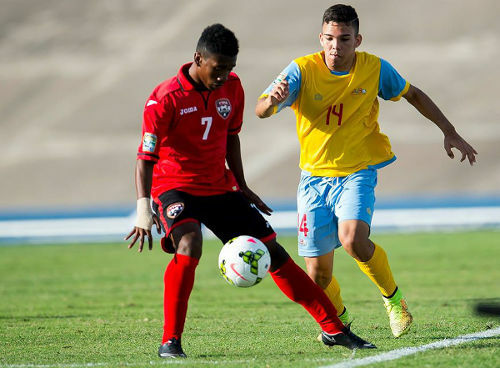 Trinidad and Tobago National Senior Team coach Stephen Hart added his fourth teenager and debutante to the “Soca Warriors” squad as DIRECTV W Connection’s Akeem “Froggy” Garcia was called up as a replacement for Central FC attacker Rundell Winchester. Photo: Trinidad and Tobago winger Akeem Garcia (left) invites Aruba defender Marcel Kock to dance in the CONCACAF Under-20 Championship. Garcia, a fine dribbler who can operate on either flank, as a centre forward or as a deep-lying forward, joins former National Under-20 teammates Shannon Gomez, Neveal Hackshaw and Aikim Andrews in the senior squad for Friday’s international friendly against Panama, which kicks off at 7 pm in the Ato Boldon Stadium, Couva. Gomez and Andrews are also employed by Connection. 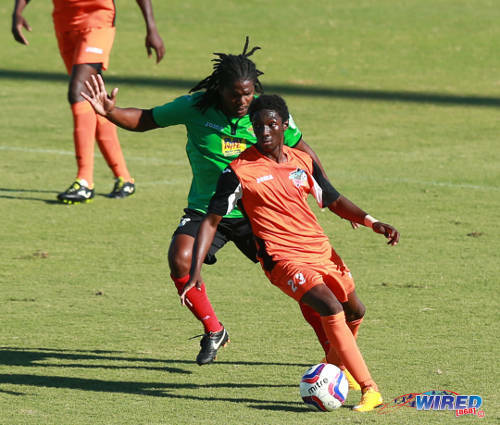 The quartet were among the main standouts for the junior Warriors at the 2015 CONCACAF Under-20 Championships in Jamaica this January. St Ann’s Rangers attacker Kadeem Corbin is just returning from injury and misses out. Notably, Hart did not select any schoolboys to his squad while his home-based call-ups are all full time Pro League employees. There was no room for Naparima College pupils Martieon Watson or Jabari Mitchell—Watson gave a solid showing in Jamaica—or summons for United States-based university students Duane Muckette, Brendon Creed, Leland Archer and Ricardo John. Nineteen-year-old midfielder Akeem Humphrey, who represents Club Sando in the Super League, also missed out. But the Super League’s schedule probably did not work in his favour as, apart from TTFA FA Cup Trophy duty, his season ended over two months ago. Photo: Club Sando midfielder Akeem Humphrey (right) tries to shake off San Juan Jabloteh player Coneal Thomas during the 2015 TTFA FA Trophy quarterfinal. Sando is set to join the Pro League line-up for the 2015/16 season but the difference in the scheduling for both competitions means that Humphrey can feasibly go eight months before his next domestic league match, which is expected to be in September. The timing of the domestic leagues and the physical condition of his squad for July’s CONCACAF Gold Cup are bound to weigh on Hart’s mind. However, at the moment, he is happy to take it one challenge at a time and is looking forward to seeing his new recruits in action against a full-strength Panama team. “It’s going to be a really good week for us,” Hart told the TTFA Media, “because we get to see how some of the players adapt to the rigors of preparing for an international game such as this and also against an opponent like Panama. Gomez is looking forward to it and is desperate to make his senior international debut. “My intention right now is to get into the team for the game on Friday,” he told the TTFA Media. “I can’t say if I will be in coach Hart’s starting team but I’ll be definitely hoping to at least come off the bench. Just thinking about earning my first cap for the country is astounding news to me and for my football career. For the 21-year-old Winchester, who has four national senior caps with no goals, a different challenge awaits. The tall, speedy Winchester, who has an eye for goal but can also operate from wide positions, is set to complete a loan deal from Central to United States A’ League team, Portland Timbers. Central director Kevin Harrison said his absence from the international squad comes with Hart’s blessing as he returns to the foreign market after a nightmarish stint with lower league Belgium club, CV Vise. 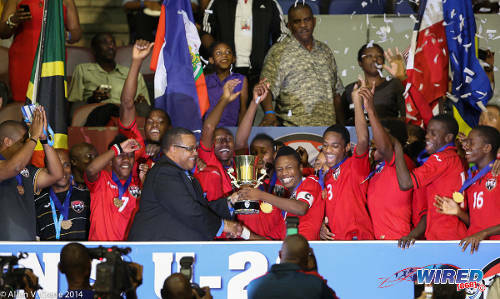 Vise, which was led by former Central coach Terry Fenwick, failed to pay salaries to Trinidad and Tobago players Winchester, Willis Plaza, Elton John and Kevon Villaroel, for much of their stay there. Central expect the former Stokelyvale attacker to have a much better time in the United States. Portland want to unveil Winchester this week and the Warriors allegedly sanctioned his absence. 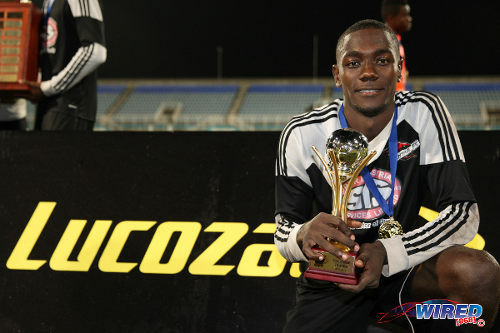 Photo: Twenty-year-old Central FC attacker Rundell Winchester was MVP of the Lucozade Sport Goal Shield. Garcia is among the new Trinidad and Tobago players who will hope to take advantage of his absence. Tickets for Trinidad and Tobago’s clash with Panama will cost $100 and are available at Fan Club (MovieTowne POS, Trincity Mall, Gulf City Mall), All Out Restaurant (Queen’s Park Oval), Heritage Sports (Tobago), Ramsingh’s Sportsworld (Couva), Econo Supermart and all Kenny’s Sports Shops. Jan Michael Williams (Central FC), Marvin Phillip (Point Fortin Civic); Justin Hoyte (Millwall), Shannon Gomez (W Connection), Sheldon Bateau (KV Mechelen), Jamal Jack (Central FC), Akeem Benjamin (Central FC), Mekeil Williams (W Connection), Uriah Bentick (Central FC); Dwane James (North East Stars), Khaleem Hyland (Racing Genk—Belgium), Neveal Hackshaw (North East Stars), Hashim Arcia (W Connection), Jomal Williams (W Connection); Aikim Andrews (W Connection), Johan Peltier (San Juan Jabloteh), Ataulla Guerra (Central FC), Kevin Molino (Orlando City—US), Tyrone Charles (San Juan Jabloteh), Akeem Garcia (W Connection), Willis Plaza (Central FC), Marcus Joseph (Point Fortin Civic). Heard his comments on the news last night. Hope he gets his dream.